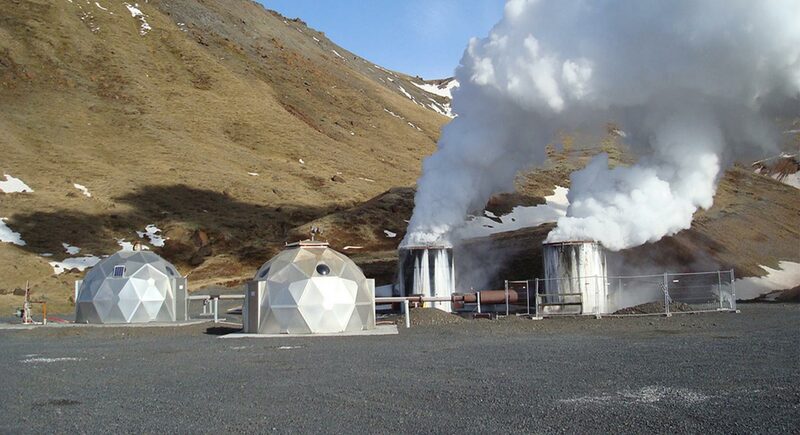 Geothermal energy refers to the production of energy using the internal heat of the Earth’s crust. This heat comes from the radioactive decay of minerals and continual heat loss from the earth’s original formation. The production of geothermal energy involves drilling wells into the Earth’s crust at approximately a depth of 3-10 km. The heat is extracted with a variety of methods but in most cases is drawn from the Earth using water and steam. Hot water from the earth may be extracted to heat homes and buildings. This is done either by directly circulating the hot water through buildings or by pumping it through a heat exchanger that transfers the heat to the building. Geothermal heat can also be used to produce electricity in a geothermal power plant. Electricity is generated when geothermal heat produces steam that spins turbines on a generator. Geothermal technology can only be used in locations with specific geologic conditions. For this reason, the major regions of geothermal development are in the most volcanically and tectonically active regions of the world. For example, heat and power plants can be found in Iceland, Indonesia, New Zealand, Hawaii, California, and Ecuador MacKay, D. (2009). Sustainable Energy - Without the Hot Air. Cambridge, UK: UIT Cambridge Ltd. MacKay, D. (2009). Sustainable Energy - Without the Hot Air. Cambridge, UK: UIT Cambridge Ltd. MacKay, D. (2009). Sustainable Energy - Without the Hot Air. Cambridge, UK: UIT Cambridge Ltd. MacKay, D. (2009). Sustainable Energy - Without the Hot Air. Cambridge, UK: UIT Cambridge Ltd. MacKay, D. (2009). Sustainable Energy - Without the Hot Air. Cambridge, UK: UIT Cambridge Ltd. MacKay, D. (2009). Sustainable Energy - Without the Hot Air. Cambridge, UK: UIT Cambridge Ltd. . In these regions, it can make up a significant portion of the power and heating sectors - for example, over 90% of space heating and over 27% of electricity in Iceland is sourced from geothermal energy Orkustofnun. (2012). Energy Statistics in Iceland 2012. Reykjavik, Iceland: Author. Orkustofnun. (2012). Energy Statistics in Iceland 2012. Reykjavik, Iceland: Author. Orkustofnun. (2012). Energy Statistics in Iceland 2012. Reykjavik, Iceland: Author. Orkustofnun. (2012). Energy Statistics in Iceland 2012. Reykjavik, Iceland: Author. Orkustofnun. (2012). Energy Statistics in Iceland 2012. Reykjavik, Iceland: Author. Orkustofnun. (2012). Energy Statistics in Iceland 2012. Reykjavik, Iceland: Author. . If managed appropriately, geothermal is a renewable and sustainable form of energy because it produces electricity using the natural heat from the Earth. When developed irresponsibly, ground temperatures below the surface may lower. Geothermal is an environmentally friendly technology because it produces little to no greenhouse gas emissions. Although geothermal energy is currently a small portion of the world’s energy supply mix, it holds great potential for future development because it is a reliable source of power generation that can serve base-load electricity needs. One concern with geothermal power is its use of groundwater. The process of extracting this water may unintentionally release carbon dioxide and hydrogen sulfide to the atmosphere. Mitigating the release of these emissions is a key challenge with developing this technology. Finally, the costs of geothermal energy are largely incurred up-front. Simply put, it is expensive to carry out the seismic sensing, test well drilling, confirmation testing, and other necessary preliminary investigations to ensure that a geothermal plant will be capable of meeting desired production specifications. ^ MacKay, D. (2009). Sustainable Energy - Without the Hot Air. Cambridge, UK: UIT Cambridge Ltd.
^ Orkustofnun. (2012). Energy Statistics in Iceland 2012. Reykjavik, Iceland: Author.